Sunset / Moonrise over Los Alamos campground. I was pretty lucky, in my opinion, to spend my first week volunteering working on trails. The other 2 primary objectives of the volunteer group is fence removal and invasive species removal. Fence removal was what we were tasked with on week 2. I can’t imagine how much work it was to install hundreds of miles of fence 30 years ago in this area, but I can imagine it was ten times harder than what we had to do which was still tough. Mouth of the Aviles Valley. Patagonia is home to an incredible number of relatively untouched terrain, and the Aviles Valley is no exception. Our goal for the week was to join the senderistas to extend the trail as far as we could in a few days work. Overview of the Lagunas Altas trek. 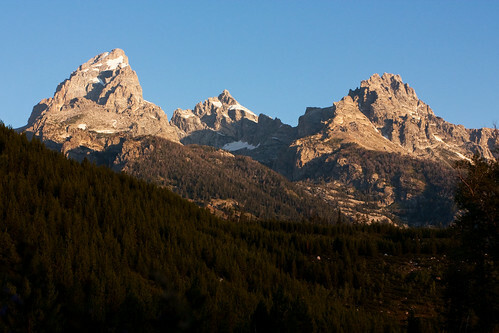 To be a national park, there must be trails for visitors to enjoy. 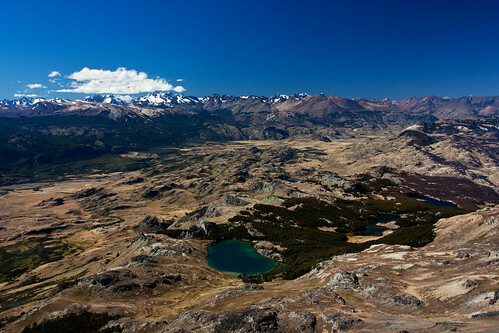 The first official trail of the future Patagonia National Park is the Lagunas Altas trek. It’s a spectacular walk and is definitely unknown at this point. I don’t know where else I would be able to hike for 3 days on such a beautiful trail and not see a single human. At least one writer for the International Business Times put this hike in his top 5 of Patagonia, and also acknowledges that its a hidden gem. Conservacion Patagonica is a conservation group based in San Francisco but primarily concerned with protecting stretches of land in Patagonia. The Chacabuco Valley is just one of these areas which will be eventually donated back to Chile in hopes that they can set examples for future preserves for the country. 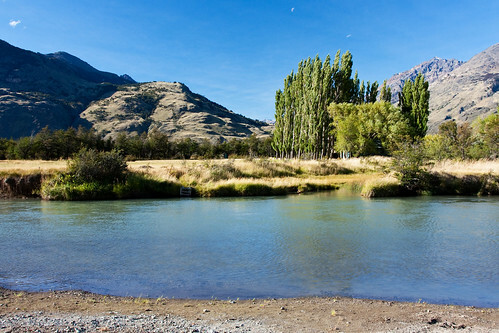 The Chacabuco Valley was previously sheep farms with hundreds of kilometers of fence installed that drastically reduced the roaming capabilities of herds of guanaco and other animals. Our goal during my time here was two-fold: remove the fence to assist in the restoration of the area back to its natural state, and construct trails for visitors to this future national park to enjoy. Time had run out on my short trip to Brazil and I was on a flight back to Chile. It was early morning on the 15th of February, my 47th day in South America. Though I had 2 weeks until I officially started volunteering at the Valle Chacabuco and future Patagonia National Park, I wanted to get there a week early to do some exploring around this relatively untouched area of Patagonia. Kevin C had told me about this little town in Chile called Pucón that, though touristy, is a great center for outdoor activities. Seemed like a perfect place to spend a few days before I had to head south to Aysén. After returning from Tronador I began my research for Brazil. Fortunately it rained all day in Bariloche so I didn’t regret staying in. Though the cheapest flight I could find was only a week long, it seemed like I could squeeze in a trip to Bonito (but save the Pantanal for another time during the dry season) and a couple of days at the Iguazu Falls. With the help of the internet and a fellow from Pantanal Expeditions, I was able to learn much about the logistics for Bonito including available tours, accommodation, and transportation. I had read about the cost of a visa for US citizens but it seemed like a minor inconvenience at the time. Before I left this on this adventure to South America, I was thinking about visiting Brazil as a backup plan in the event that I couldn’t find a climbing partner. However, in my head I imagined that my main option would be Rio or Sao Paulo for Carnival. To visit during Carnival requires planning far in advance because it becomes impossible to find a bed. Additionally, since Carnival in the major Brazilian cities is basically the largest and craziest street party in the world, I figured it wouldn’t be fun alone. Thus, I nearly ruled out Brazil and focused my planning on Uruguay, Argentina, and Chile. Brazil re-entered my thoughts in Bariloche when I was talking to a girl from the Rio Grande do Sul state of Brazil. She was giving me plenty of new information but what piqued my interest was the Pantanal. Somehow I had never heard of this place which is the largest marshland in the world and has one of the most diverse flora and fauna of anywhere. The relatively small area (about the size of Wisconsin) has more species of birds than all of North America. When I was rethinking my plans in the hut on Monte Tronador, the Pantanal seemed like the most interesting option. Even better is that a town called Bonito is not far south, making for an awesome combination. Bonito is one of the ecotouring capitals of Brazil, featuring large sinkholes, caves, rafting, freshwater snorkeling, and various other activities. Unfortunately by the time it came around to booking flights, the only modestly priced one was only a week long. Since February is a bad month for wildlife spotting in the Pantanal anyway, and I didn’t have my 400mm lens, I decided that a week of Bonito and the Iguazu Falls would be my plan. About an hour after we were told that they had no cars available at the Puerto Montt airport, despite my reservation, I was over the initial frustration. This wasn’t completely unexpected for me, as I’ve read many stories of this happening at other small places. Regardless it meant we couldn’t go to Cochamó and had to find a backup plan. Puerto Montt wasn’t very appealing to us so we decided to give Puerto Varas a try. It didn’t take long for us to realize we made the right choice of leaving Puerto Montt. Though touristy, PV definitely is more attractive and kind of reminded me of Jackson, WY with a beach with the picturesque Volcán Osorno as a backdrop. We walked into the Casa Azul and made reservations for 3 nights and set out to figure out what we would do for the next 3 days. I really wanted to climb Osorno with Ange and a guide because I figured it would give both of us good exposure to volcano climbing with less risk. Not to mention apparently guides are required now after two Frenchmen died in crevasse last month (still need to verify this story). Unfortunately we discovered once again that prices have skyrocketed since my guidebook was published. All of the companies wanted at least USD$360 per person, which was almost double the USD$200 my guidebook reported. Next option was seakayaking which was still expensive but 1/3 the price so we booked it. The areas of Chile from the island of Chiloé south to Cape Horn are so remote and fractured by fjords that the only way to travel in this area is through the numerous fjords. Ever since visiting Doubtful and Milford Sounds in New Zealand l have been fascinated with the remoteness and uninhabitable nature of these deep fjords carved by glaciers during the ice ages. Not only does the Navimag ferry allow you to see these remote lands, but it provides an excellent method of travel from Puerto Natales to Puerto Montt. The Navimag started as a cargo ferry, but as its popularity grew it became less of a means of transporting cargo and more of a means of transporting passengers. For this reason it is in no way a luxury cruiseliner, though the scenery is 5 star. As it turns out, when factoring in the full board meals, accommodation and cost of travel its not a bad deal either. We paid USD$380 per person (10% code in TDP map given by CONAF!) for a 4 bunk room that we would end up sharing with a great young couple from Holland: Renzo who works on a boat that builds offshore drilling rigs and Lonica who is a KLM flight attendant. One of the main focuses of our trip to South America was a trip to Torres del Paine. TDP is a national park that, despite being in a remote southern point of Chile, celebrates international acclaim and is visited by many foreign and local visitors every day. We visited this park during one of the busiest, but warmest, months of the year. Its been about a week since I left the states and my mind isn’t used to the idea that I am not done. It has been programmed to expect 7 to 9 day vacations and I’m happy to know that I am only 10% through. The week was jam packed since we are trying to fit in as much as possible while Ange is here (until 1/24). For this reason, we haven’t had much downtime and I’ve had no motivation to type too much on my Android tablet. Well today we are returning to El Calafate from a short 2 nights in El Chaltén on a 3 hour bus and this seemed to be a good way to pass the time. Looking out from the Alhambra to the Sierra Nevadas, towering over Granada. I could tell you that we went to Spain because it has always been my dream to travel to Spain, because I was fascinated with the culture, food and los toros y los matadores, etc. But that wouldn’t be true. It was as simple as this: Chad saw flights for only $280 roundtrip from NYC. While its true that I had always been interested in Spain, the only matter of convincing Angela and I needed was the price of the flight. We would go in early April, before high tourist season and right when all of the flowers were blooming. The timing was perfect. Perhaps the Mediterranean was still a bit too cold to swim, but I’ve been to Lake Erie a bunch and figured I wasn’t missing much, right? The Oregon coast as seen from Ecola State Park. It seemed that when all of a sudden our travels starting taking us west, we always ended up in desert climates. Joshua Tree, the Grand Canyon, Las Vegas, Zion, Bryce, and all of the sites in between. Deserts are awesome, but I always felt like I was only seeing a portion of what the west had to offer. Portland was high on my list of places to visit after hearing about the biking culture, the outdoorsy population, the Cascades, Columbia River Gorge, and Smith Rock. Ange had a buy one get one $99 companion ticket to use, so it seemed logical that the way to get the most bang for the buck was to travel as far as possible in the continental U.S. (to a place we wanted to visit, that is). Most of our reading indicated that the best time to visit the PNW was the summer. However, we were eager to have a trip before then, and we had to use the BOGO$99 ticket before it expired. We decided to go in March.